Do You Fit This Profile For An Older Bride? Feel comfortable in what you are wearing. You also more than likely want a little more coverage in a bridal gown than a younger bride would, yet you donÂ’t want to look matronly. You desire a vibrant, sophisticated appearance, for an age appropriate wedding dress. But the challenge is there isn't a category of dress styles labeled "mature" wedding dresses. As it stands now . . . mature brides have a difficult time finding age appropriate wedding attire that they feel comfortable wearing. Wanted some sort of sleeves - 3/4 length sleeves was the number one choice then cap sleeves, long sleeves, short sleeves then straps. Necklines V- necklines was the number one choice. The next was bateau, jewel neck, off the shoulder and then one shoulder strap in that order. Portrait and sweetheart were suggested choices by some doing the survey. Most prefered for more coverage a shrug or jacket over using a wrap to wear with a strapless wedding gown since that is the style of choice for wedding dress designers. More streamline silhouettes, like a sheath or medium full a-line or princess line. Shorter trains - most wanted no train at all or just a sweep train. Non-traditional wedding dresses such as, mother's dresses had high numbers followed by a wedding suit and evening dress. A small percentage wanted a traditional wedding gown. "I know it may not seem so but there is a good supply of wedding dress styles for the older bride who wants a 'modestly styled'-- but still 'stylish' gown ---on the market!" "You just have to be willing do a little searching on the web to find your perfect wedding dress. On the pages of this site I will display a sampling of gowns you might consider." Wedding dresses with sleeves Learn how to pick the right sleeve length that flatters you. Wedding suit If you prefer a bridal suit you can read about those tips here. Mother of the bride gowns are great for wedding dress alternatives. Second time bride What should you know if you are a second time or encore bride? You will find these tips helpful. Long-sleeved Wedding Dresses Who knew long sleeves dresses could look so elegant on a wedding gown? Need some advice about what's appropriate or do you need answers to etiquette questions. The following wedding attire tips and advice are based on my experiences working with mature brides as a bridal dressmaker, as an alterations specialist and on the advice of fashion experts. The best wedding dress silhouettes for the older bride. Read this article for the tips and advice given. Read this article FAQ from Mature Brides. Find out if you should wear a gown with a train, wear a traditional gown or wear a white wedding dress? Are there any etiquette rules an older bride need to follow when choosing an age appropriate wedding dress? No, there are no rules of etiquette you have to follow. 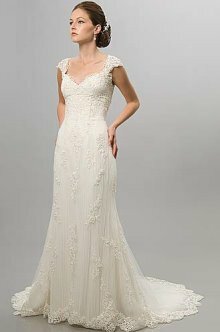 But generally, I have found that brides over 50, want a gown with sleeves and modest front and back necklines. A bride between 40 and 50 years old, might not mind wearing a strapless wedding dresses or a halter style bridal gowns with low back necklines. Brides over 50 and 60 year old however, will also wear a strapless dress or even a halter but will usually opt to wear a jacket or wrap over it for modesty and comfort from what I have observed. But of course, it all boils down to what you feel comfortable wearing and what compliments you! Wedding dresses for older brides Here is a shop of wedding gown styles mature brides may like. Looking for white short bridal suits? Then check out this shop. Are You A Mature Bride Who Need Some Wedding Dress Advice? Would you like to receive or give other mature brides, wedding dress advice? Have you encountered a problem choosing, buying, or having your dress altered? Maybe you have helpful tips you would like to pass on to other brides searching for their wedding dress. Wedding Dress Advice Please Help!